It was in the era of the Hasmoneans (the second to first centuries B.C.E.) 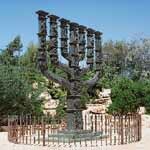 that the Menorah (the seven branch candelabrum) first served as a national symbol. Upon the foundation of the State of Israel, it was chosen as its emblem, to symbolize the continuity and eternity of the Jewish People. The central branch presents the essence of the Jewish existence, the main elements of its faith and central figures in the life of the nation.